It's October. Yay. Now it's officially autumn. Jumpers are out of the drawers, dressing gowns on a morning are becoming a necessity (or I want them to be, at least), and though I've been having warm breakfasts even through the summer, I'm enjoying them a lot more now. Ever since I turned the calendar over, I've suddenly felt so cosy, so calm, and yet at the same time enthusiastic. I think it's because my mind is calmer and so ideas are coming more easily. Even my writing has been going a little better - I'd been struggling for the past couple of weeks, doing shop work in the day and writing in the evening, which isn't unusual, but I've been feeling very sleepy and it's been getting in the way. Now, though, it seems to be passing. When the autumn comes, new video games are usually released, too, so another "it's autumn!" sign is when Seeg starts taking over the PS4 and getting in the way of whatever show I'm presently binge-watching (right now, Stargate SG-1). That's fine, though, because watching him play video games is one of my favourite pass-times, and quite surprisingly also makes it easier for me to write. I think it's the ambient music and all the non-essential side quests and exploring. I enjoy watching that, but it's also non-distracting. I know. It doesn't make any sense, but I concentrate better when he's playing video games, and when my thoughts get jumbled, I have something to watch while my mind unravels rather than trying to pick at the knots and make them worse. Nothing worth watching has come out just yet, though - Assassin's Creed Origins and the Horizon DLC aren't due out for a month - but he has started replaying Sleeping Dogs, which was a damned good game. So I'm happy, I'm concentrated, I'm calm, work is going well, and my new Christmas wildlife jewellery collection is almost done! And I've been working on lots of gift guides for the blog, so while I've been busy busy busy, I'm totally on top of it all. And so my mind has been turning towards cooking more often. I don't usually try to be all that inventive with dinner - I'll think of a dominant ingredient and just google some recipes. I rarely have the energy or drive to experiment. But when autumn comes along and Christmas is on the horizon, that usually changes, and this year it's been happening more than most, and no doubt because I've been trying to put carbs back into my diet. A whole world of food has been opened up to me. Even fruit is back on the menu, and I've been relishing it. I was in Tesco on Monday, doing the weekly shop, and I found figs. They weren't on display yet, rather their crate had been dumped on top of boxes of jaffa cakes at the end of an aisle, so while I would usually walk past and ignore it for the sake of my waistline, when I saw punnets, regardless of what was in them, I stopped to look. I'd wanted plums, to be honest, but the shelves were all half-empty, and as I didn't really have a clue about figs, naturally I put them straight in the basket. My only knowledge of figs comes from fig rolls (and I have no idea how much of the flavour was fig and how much was fake), from nature documentaries with monkeys throwing them at camera people, and from this amazing article I read a few months ago about the fig tree's immense impact on human culture and development. If I'm honest, it was partly that article that encouraged them to fly out of that half-empty, untagged crate and into my basket. My original plan for the plums was just as an addition to my usual morning porridge, but when I found myself looking at the fruit when I got home wondering what the hell I was going to do with them, as I had little idea what they tasted or felt like (as I said, fig rolls), I decided to do some research and find out what they were like. 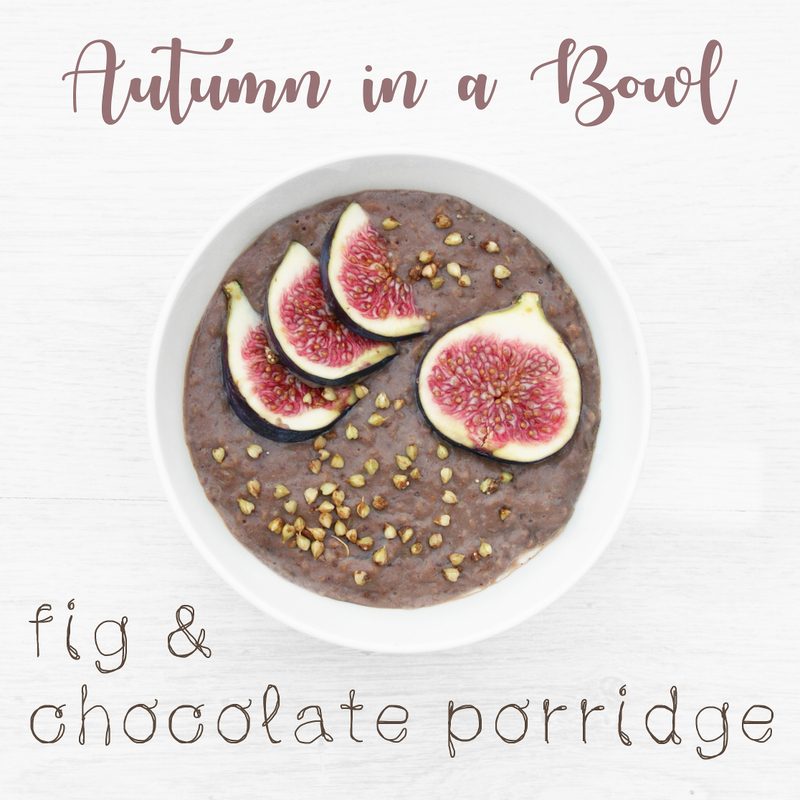 And so came this super simple chocolate (cacao) and fig porridge bowl. Also, how freaking pretty are figs? And not just visually - nutritionally, too! Figs are rich in dietary fibre which slows the release of its natural sugars, keeping you going for longer, and they're also ridiculously rich in calcium (as much per half cup as a half cup of milk) and potassium, and are a source of magnesium, copper, iron and antioxidant vitamins A, E and K. They weigh in at around 55g per fresh fig, 40 calories and 10g of carbs and 1g fibre, and two fresh figs count as 1 of your 5 a day. This chocolate and fig porridge blends the bitterness of cacao with the sweetness of figs for a perfectly balanced taste, as well as a ridiculously nutritious breakfast. Perfect for easing into the darker mornings. 1. Combine oats, cinnamon, cacao and, if using, whey and cacao nibs/buckwheat in a saucepan along with the boiled water and milk. Bring to a boil over medium heat and stir to combine. 2. Lower the heat to a simmer and allow it to thicken. 3. Meanwhile, chop your figs into chunks (save a few slices for garnish) then add them to the pan, stirring again to combine. 4. Leave to thicken over a low heat, stirring occasionally. 5. 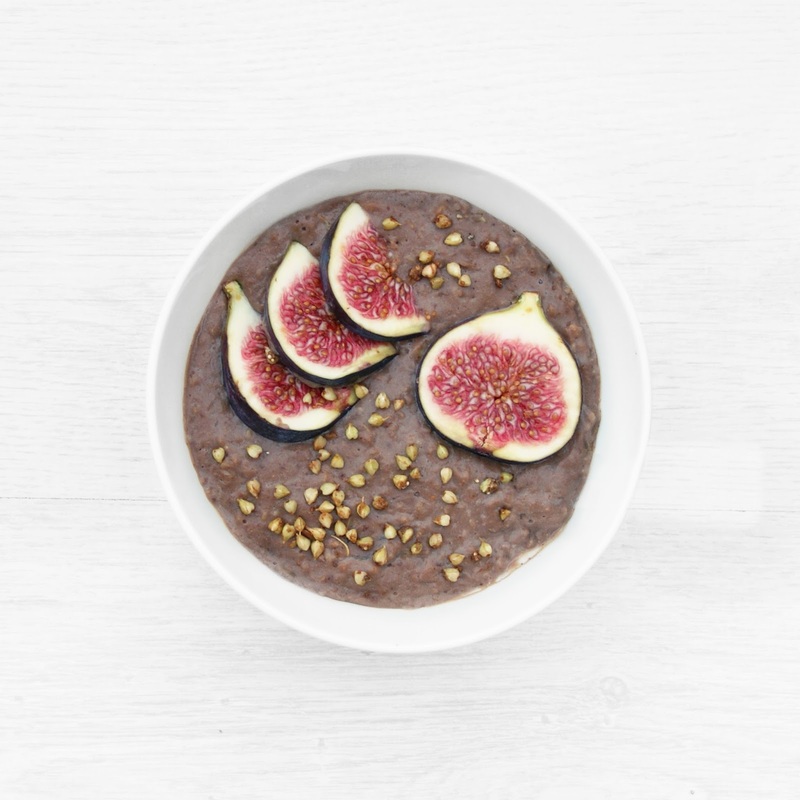 Transfer to a bowl, garnish with fig slices and serve with optional honey and additional sprinkling of cacao nibs or buckwheat.